The Return of Christopher Columbus is a great example of how one man’s trash is another man’s (stolen) treasure. 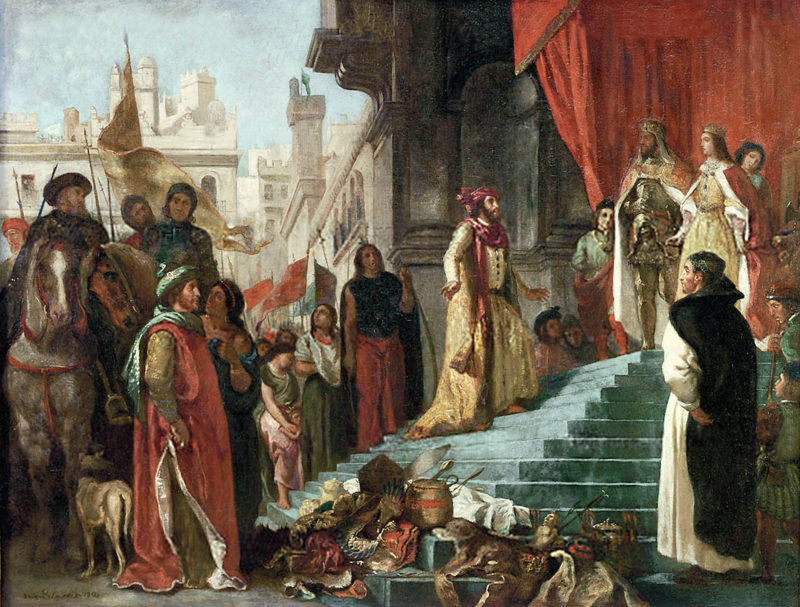 Thankfully, Delacroix’s rendition of King Ferdinand and Queen Isabella, the monarchs who funded Christopher Columbus’s bold voyage to the New World, is a little more forgiving than Emanuel Leutze’s treatment of a similar subject. Whereas Leutze’s Queen Isabella embodies the phrase “SMH” nearly two centuries before it was even a thing, Delacroix’s monarchs appear to be a little bit more onboard with the wacky explorer. But not by much. I mean, how would you feel if you funded a voyage only to be presented with what looks like a pile of knick knacks? After pretty much begging the king and queen of Spain to fund a trip to the New World, the spoils of this sought-after trip were a bunch of animal pelts, weapons, and statues. You can see why the Spanish royals were a little underwhelmed with these so-called treasures. His only saving grace was the gold he brought back. But I guess this paltry pile of objects was ultimately enough for both the monarchs. Columbus ultimately traveled to America – or rather what he thought was America – four times throughout his life. Today, we know that he was actually sailing to the Caribbean and the northern coast of South America. What Delacroix really highlights is that Columbus brought back real live indigenous peoples from the New World. Even though we still haven’t gotten away from the term “discover” when discussing Columbus, there were plenty of peoples who had already been living there. Columbus met many of them, and he even picked favorites. He loved the Arawaks of Española, not only for their attractive looks and mild mannerisms, but probably also because they brought him tons of gifts. Like a mean girl in high school, Columbus even hated the same peoples that the Arawaks hated – the rival group the Caribs, who shot poison arrows at the European invaders. This focus on indigenous peoples fits with the Romanticism of Delacroix’s body of work. He loved the thought of the exotic Other and often returned to this subject in his art. Other French artists working around this time, such as Jean-Auguste-Dominique Ingres and Jean-Léon Gérôme also loved the idea of exotic peoples. The motives behind these depictions are all pretty racist, but at least Delacroix wasn’t afraid to show us their dark skin. Looking at you and your porcelain doll people, Ingres. The ideas of exploration, adventure, and newfound peoples also jived with the Russian count Anatole Demidoff, who commissioned this and one other painting from Delacroix. This painting’s companion piece, which is now in the National Gallery of Art in Washington DC, imagines Columbus and his young son seven years before the first voyage to the New World. You see, Demidoff fancied himself an amateur explorer of sorts. He took it upon himself to establish a team of twenty-two men to survey lands that Russia had acquired in the mid-1800s. So, although these expeditions were significant for Russia, he wasn’t really the Russian Columbus. Nice try, Demidoff. Demidoff, Alexandre G. Tissot. “Princes of San Donato.” October 2000. John Singer Sargent Virtual Gallery. http://www.jssgallery.org/Essay/Italy/Demidoff/Demidoff_1st.htm . Accessed May 1, 2018. Galitz, Kathryn Calley. “Romanticism.” October 2004. The Heilbrunn Timeline of Art History. The Metropolitan Museum of Art. https://www.metmuseum.org/toah/hd/roma/hd_roma.htm. Accessed May 1, 2018. Smithsonian. “Columbus’ Confusion About the New World.” Smithsonian Magazine. October 2009. https://www.smithsonianmag.com/travel/columbus-confusion-about-the-new-w.... Accessed May 1, 2018. The Art Story. “Eugene Delacroix.” Artists. http://www.theartstory.org/artist-delacroix-eugene.htm. Accessed May 1, 2018. Toledo Museum of Art. “The Return of Christopher Columbus.” Collection. http://emuseum.toledomuseum.org/objects/55169/the-return-of-christopher-.... Accessed May 1, 2018.